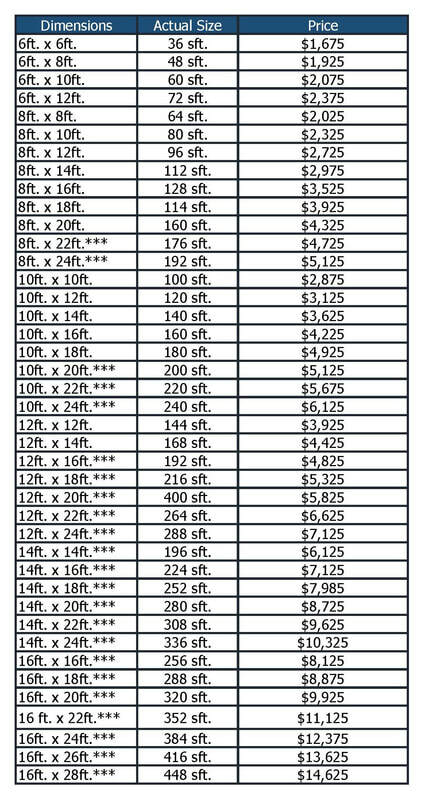 ​​NOTE: Sizes with *** indicate slab required,or have a floor frame charge of $2.73 / sq ft. Buildings over 200 square feet may have additional requirements. ​Please check with local Building Departments for rules and setback requirements. Classic New England features are the inspiration for our Salt Box shed design. This design features a short front roof and a gentle sloping rear roof. A perfect compliment for those who own a Salt Box Style home or may be looking to store their garden tools in a quaint storage unit that is old world inspired. Additionally, the front wall post height is 6'-5" to accommodate a traditional board and batten or custom handcrafted beadboard or transom door. The Salt Box design can be upgraded with features like cedar shingles, a red cedar roof, or double hung windows. Like all of the designs featured at Salt Spray Sheds, the Salt Box Design can be customized to meet your needs. Our price includes on-site building and taxes. For those customers over the bridge, a delivery charge may apply. WINDOW BOXES: Composite PVC Window Box includes secure joints and drainage holes to allow water and comes with mounting brackets. Made in the USA. HIGHER POSTS: 7'-4" or 8'-0"
DOORS: Single and double row transom or beadboard. Doors available Pine, Fir, and Mahogany. ​​*If the building site requires higher than normal blocks to level the floor frame, it will require a long door ramp; a small charge will apply. Additionally, it may be closed during normal office hours, while we complete a permit or site visit appointments or due to inclement weather. Please call ahead, 508-398-1900. The office is closed on all federal holidays. Please Note: Appointments are always available.